I’ve had a GE LF-116 radio in my office for a while and now that I’ve started to clear my long backlog of projects it’s finally made it up to my bench. I’ve displayed it in my office holding up a monitor for a while but it’s made it onto my list of October projects. It doesn’t look like much. Most radios after 1940 until this style died out seem to all look about the same to me. It has interesting enough features and is fairly rare, though, so it was worth preserving – AM Broadcast and Shortwave reception with a tuned RF amplifier, and early FM and a high-end audio output. 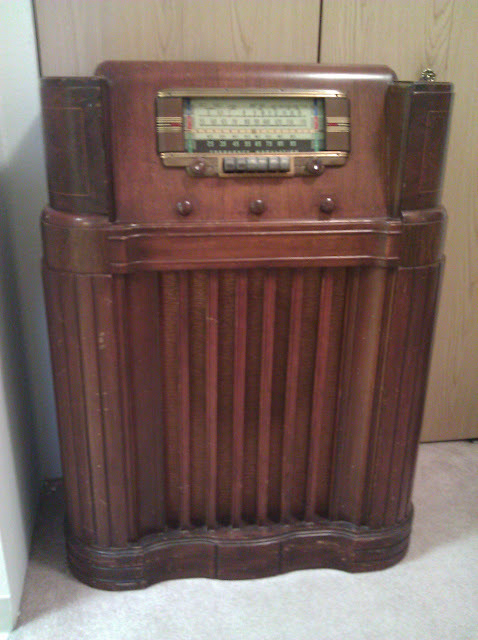 Relatively few radios were manufactured with the original pre-war FM band, 42-50MHz and they tended to be high end models, this one no exception. With 11 tubes, including two 6V6GT tubes in push-pull output, a tuned RF amplifier on AM and high-fidelity system on FM. The radio was designed at a time when television had just been invented and wasn’t widely adopted and before the U.S. became heavily involved in WW2 and domestic radio production was halted, and as I mentioned, at a time when FM radio was 42-50MHz instead of the current 88-108MHz. There was an exceptionally nasty series of court battles and “lobbyist activity” which ultimately resulted in the band being moved in June 1945 – and the first year major domestic mass production of radios returned was in 1946. A few niche-market or higher-end radios contained both bands for a very short time – like the Zenith 7H820 – but most stations on the old band quickly went bankrupt. and it was eliminated. As noted in the article, there were some physical constraints – that frequency range happens to have particularly bad interference characteristics and has been mostly abandoned today, so it’s not entirely lobbyists. It’s important because they designed the most of the radio’s circuitry to be fairly broadly resonant – in this case, this radio is known to work up to around 99MHz of the modern FM band on strong stations by taking advantage of the 2nd harmonic of the local oscillator. There are some slightly different audio parameters between the two sets of broadcasts but the older circuitry is so broadly tuned it makes it work. 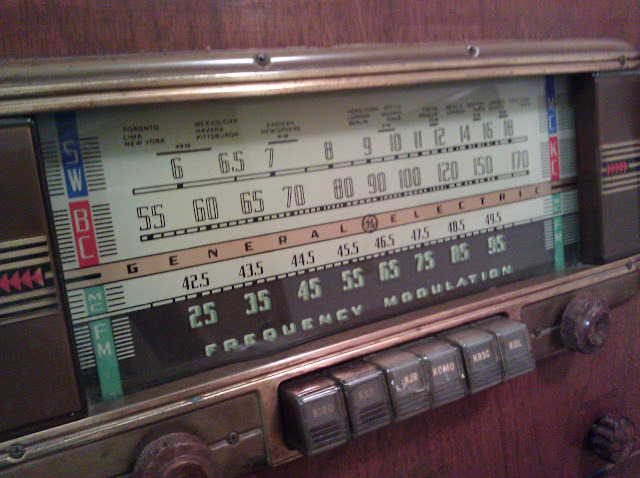 The preset buttons are labeled with local Seattle stations, although they’ve since changed frequencies over the years. There’s a 12″ speaker driven by around 5W of power. 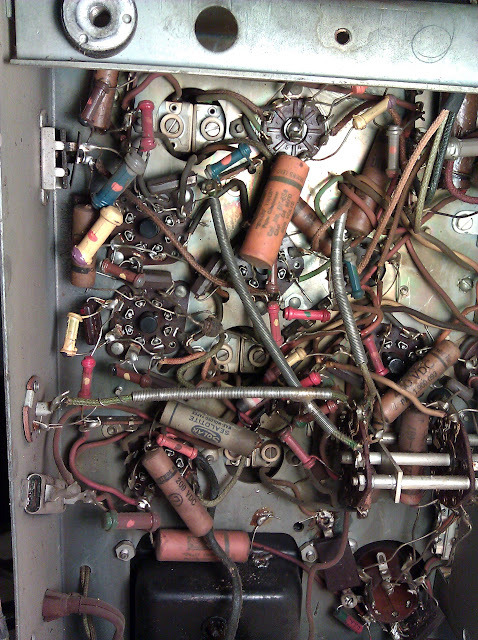 The radio itself has 11 tubes, one of the more complicated ones I’ve tackled so far. The chassis also looks the least friendly, of course – but it’s in excellent physical condition at first glance, which will make it easier. It’s just very cramped underneath. With an 11 tube line-up of 6SG7 6SG7 7Q7 6SG7 6SH7 6SH7 6SQ7 7K7 6V6GT 6V6GT 5U4G there’s going to be lot of circuitry. It’s also difficult to mount anything to the side of it for suspending the chassis above the work surface because of protruding screws and a sheet metal seam. I’ll have to build a new jig from an idea I read – a thick board drilled in a grid for dowels cut to length to suspend the chassis above a work surface by holding it up by the middle. It’ll cost around $20 in materials at Home Deopt, I imagine. That’ll be for the next segment. In the mean time, I’m fairly worried about this power transformer. 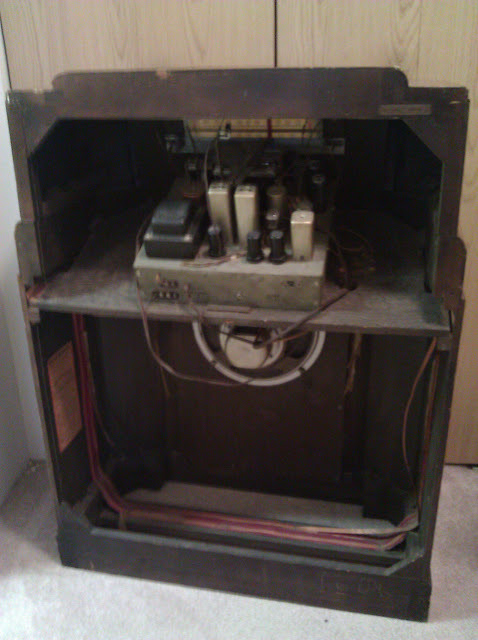 Combined with the fact this radio came with every tube except the 5U4 rectifier, I suspect the previous owner may have damaged it by trying to plug it in – or else it just failed this way in its past life and was put into storage. 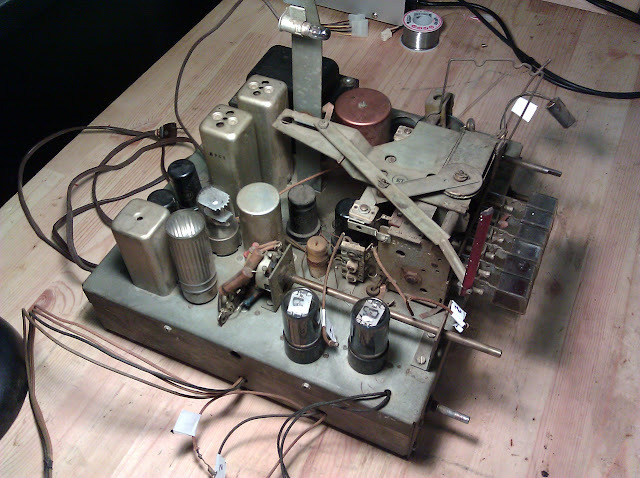 This entry was posted in Electronics, Projects, Radios and Tubes, Vintage and tagged antique radio, antiques, display, GE, General Electric, LF-116, old radio, pre-war FM, repair, restoration, shortwave radio, tube radio, vintage radio. Bookmark the permalink. How do I find the value of this radio? I have one in perfect condition. “As found”, non-working or non-tested likely around $100; restored and working likely $200-300. 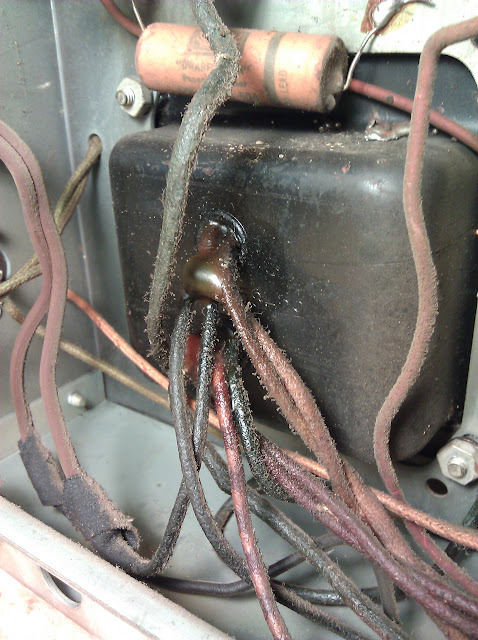 A full electrical repair on that model runs around $200-300, typically. Thank you for your entire labor on this web site. My mum enjoys getting into internet research and it is simple to grasp why. My partner and i notice all concerning the dynamic mode you render simple ideas by means of the web blog and in addition foster participation from other individuals about this idea while our simple princess is truly understanding a lot. Take pleasure in the rest of the year. You are doing a stunning job.